The Hawks struggled for connection when entering forward 50 on the weekend. Mike Sheahan had a bone to pick when he went on radio last week. “I think clearly we need to redefine the inside 50," Sheahan said on SEN Breakfast on Friday. "The commentariat places way too much emphasis on how many times the ball passes the 50m arc and it’s a nonsense." Sheahan went on to use Lance Franklin's entries as an example, with the Swans forward wastefully kicking the ball back to Demons defenders multiple times in his side's loss the previous night. Yet, on the stat sheet, that inside 50 looks exactly the same as a pin-point pass that results in a goal. It may be a divisive stance, but you can see the veteran journalist's point - the value of a side's forward delivery can range from perfection to problematic. Hawthorn's match up with St Kilda on Sunday was testament to exactly that. On the surface, the final tally of the Hawks’ 53 inside 50s to the Saints’ 51 looks a reflection of the arm wrestle that the game was. And, in many respects, that is true. But a look at the final term's inside 50 register tells an interesting tale. The Saints recorded their third victory of the season on the back of a dominant fourth quarter. But Alan Richardson's side only went inside its forward 50 four more times than the Hawks in the fourth term (14-10), but generated seven shots at goal to the Hawks' one. The Hawks’ 10 per cent scoring efficiency when going inside 50 in Sunday's final quarter, compared to the Saints’ 47 per cent, proved costly. In fact, despite holding as much as a 26-point buffer midway through the third quarter, this area was a downfall of the Hawks all day. 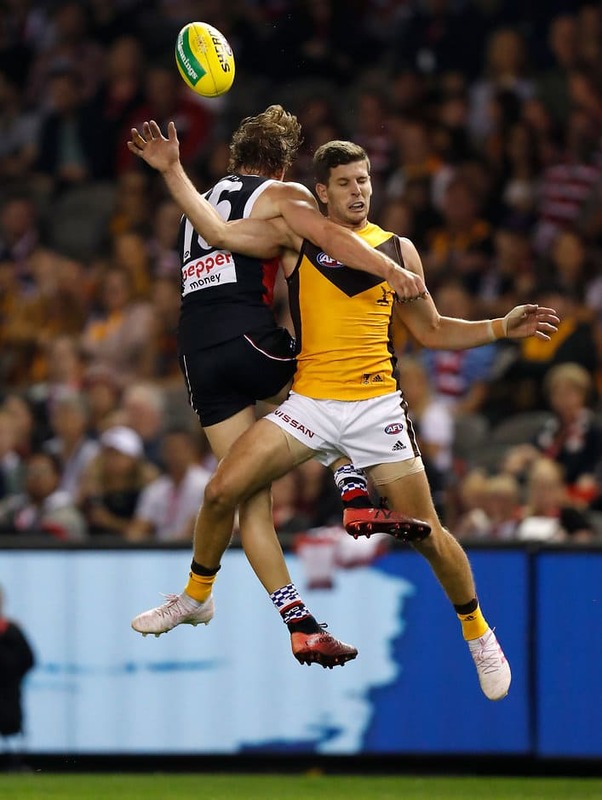 The Saints’ efficiency was better than the Hawks in every quarter: 42 per cent to 39 per cent in the first, 42 per cent to 38 per cent in the second, 64 per cent to 50 per cent in the third and, again, 47 per cent to 10 per cent in the last. This will be an area of improvement for the Hawks going into their massive Easter Monday clash against Geelong.